B) seal a very nasty hex you're casting on someone else. Just keep that in mind you can put it in the graveyard but that way be more then you need. I would, if you couldn't get the bottle someplace where they'll walk over it or by it everyday, hide it in the hollow of a tree. This sort of spell works best when they walk over it and contact it spiritually, so to an experienced worker such as myself, it seems that your link to them is very weak, if you do not even know where they live. To strengthen your intent and linkage, keep the bottle around and shake it up regularly, while cursing, to add what energy you can. Stash it behind the toilet on the ground (low, down, and dirty) while having it in your home. Do this for at least one cycle of the moon before burying it at a graveyard, and when you do so, call upon (and pay) a reckless spirit to carry it to them, since you are unable to do so yourself. But, still, please do understand that this spell is based on contact, so attempt that, if possible. First, my pup has a lot of health and other problems and i know if i can communicate with him i can help him more. I have not received the kit and candle at my home yet but I know the candle from Lucky Mojo has started. One issue is I have a lot of trouble qieting my minf and relaxing to do spellwork or thing like that. Thanks so much in advance. My guess is that since you have been drawn to animal rescue work you probably already have a gift of animal communication, at least latently, within you and that what you need is to wake that gift up. The psychic vision spell kit from Lucky Mojo is a great place to start with this. You might want to make a mojo--or one might come with the kit actually--I'm not sure--that incorporates something of your animals--like your dog's hair or nail clippings, and something that can symbolize the whole animal kingdom for yourself to increase communication. Or, if you do a primary kind of rescue--like all dogs or all cats or cats/dogs and nothing else then maybe you want to add things that represent those specific creatures or breeds that you work with on a regular basis. If you have a dear animal that you loved that has departed from the world you might want to work with their graveyard dirt asking to have your gift awakened so that it can be put to use. And, since we are on the subject and I do rescue work myself, I'll mention what you probably already know which is forming relationships with animals that have escaped abusive situations is very similar to forming relationships with people who have escaped abusive situations--getting their trust takes longer and communication may be slower, so don't get frustrated if things take awhile in this realm. I hate to sound silly, but have you ever watched The Dog Whisperer? You can learn a lot about reading an animal's energy and body language. And his advice applies to other species as well, as far as reading the energy and observing the mannerisms of whatever animal species you are working with. My advise is forget about human communication, balance your own energy and spend some time observing and even copying the animal's behavior that you work with- they can tell you a lot when you get over the idea that "they think they're people"- they aren't but it doesn't mean they can't speak as clearly in their own way. There are notable horses, cats, dogs, birds, and animals of many species who achieved world-wide recognition. You may also have links to personal friend-animal spirits who will help you, but are known only to you and members of your family. A few thoughts I'd like to add here. I like to think I have pretty decent communication skills with my own animals --right now just one cat-- and not too bad with others' cats and dogs. You mention a concern about quieting your mind. That can be a big barrier to receiving information coming in from your animal friends. It is when you are quiet that you can best "listen". If it's only about feeling that you have difficulty quieting your mind to "do spellwork" then I must share my experience that the physical activities of preparing the spell actually calm and slow my mind. I often feel that I am unable to just sit and pray, but the choosing of appropriate materials (candles, oils, other material), the physical actions of arranging, dressing candles, annointing and so on actually organize and calm the "chattering" to create a focus. Once the spell as been set into motion with the lighting of a candle or whatever, I can relax and know that the physical items I have prepared and arranged are holding the intention and sending it out to Spirit that my mind has difficulty doing all by itself. So please don't discount your ability to do spellwork because you "can't relax" or "get quiet". I think you may find that the very process can provide those things. I think that along with Psychic vision spell kit, a great place to start is by using the graveyard dirt of an animal that was widely recognized as cat mentioned, or one that was close to you that you have a good relationship with. Working with graveyard dirt is probably not going to be covered in books that are talking about magic from a Wiccan point of view because it is a Hoodoo practice. Look up graveyard dirt on the Lucky Mojo site and spring for cat's hoodoo herb, root, and mineral book--its worth it There are a number of ways you can work with graveyard dirt, you can start by putting it on your altar, lighting a candle for the spirit and asking the animal spirit to help you wake up your gift for communication so that you can better the life of your pup and of all of the animals that you help every day. Fantastic info THANKS.i have some graveyard dirt someone got me from the graveyard in Salem, Mass. it was a cemetary for people and animals. what about this??? (i think not because i am not sure who or what the dirt has in it, right??) i am gonna get that book sounds great. I think that you will find this *very* helpful to you in your workings. The other kind of graveyard dirt to work with of course is that from a person's grave who was a very effective animal trainer/communicator. If you were able to get their dirt along with the dirt of an animal that they trained or worked with that would be great too. Have you thought of using shamanic visioning? Please tell me more about Shamanic Visioning Please. I am gonna do the Pyschic Vision Kit,the pyschic vision candle,the loadstone,possible jobs tears(I am not sure if they are appropiate). Please let me know how to start like I said I have so many books on altars, spells,candlesss,divination,crystals I am alittle confused. So Sorry I just want to do the right thing and I would like to get the info so I can start even it takes a while. Sharon, dear. In this post and others I see/hear your distress. Please consider that you are confused because you are stressed with trying to care for your sick dog. This all contributes to your difficulty with calming your mind mentioned in one of your first posts. Please, may I advise you to slow down and stop reading multiple sources of information? Your most valuable source of information is Brody. I am not saying that anything you've read is wrong or right, but you've just said it's all confusing you. So, do one thing at a time. You have kits on order. You have candle(s) lit for you at the store. Relax and let them do their work. Know that you HAVE started. You can do your part by caring for Brody and spending time with him. The more you can read him instead of a book or a website, the more you will get better at reading him. I extend you my sincerest blessings for your calmness as Brody's caregiver and for Brody's health. PS In the state you are in (confusion, distress), pursuing a shamanic vision is not something I would recommend that you do alone (without an experienced practitioner of such things to guide and teach you). I believe this sort of thing is beyond the intended scope of this forum. You are right. What i was explaining -- and Bri was emphasizing -- is not the use of graveyard dirt -- contact with the sirits of the dead per se -- but rather contact with the graveyard dirt and thus contact with a specific animal of the species with which you are seeking to establish psychic communication. You have expressed an interest in working on a psychic level with dogs, therefore you would seek graveyard dirt from the grave of a celebrated and communicative dog who had a great relationship with people. You will work with this animal spirit at your altar through the medium of the dirt, asking for help in increasing your psychic sensitivity to other dogs. It will tell you some of the ways in which you can ritually collect grave yard dirt in conjure tradition, as well as different ways on how you can work with the dirt. In your case, you will need to do the homework of finding the grave of a specific animal whose spirit is strong and helpful and who was known in life to be good at communicating (preferably with large numbers of people.) If that is too much of a project at this point in time then an alternative would be to get grave yard dirt from a companion animal that you had in your life and that you communicated with well. That link will tell me what to do with the graveyard dirt once i collect right??? I will try and do the research. Does anyone currently on this site have the grave of a deceased animal communicator dog or anything like that I could purchase. If there is help for this as well as a sort walking me through the spell or using the graveyard dirt. Try working with a companion animal who loved you. Ask their spirit to help you to ccommunicate better with Brody and to help Brody communicate better with you. I read on the use of grave yard dirt I did not see anything withuses for animal communication of deceased animals or their spirits or asking for help did I miss something??? Mention is made to use of graveyard dirt from the grave of someone who loved you for use in certain rootwork.....Using the dirt from over the heart if love work is needed, with payment of course. If one was doing reconciliation work, and one felt connected to the intended's dead relative through photos, talk of memories of the dead relative, feeling that person's presence, (getting a good feeling, one of approval) bearing in mind here I am not talking about knowing this person before they died, only after they had been dead, then I would believe that after visiting the grave and connecting with this person's spirit, bringing the gifts, etc, one would ask for help for the good of all and make payment. I like the idea of a soldier.....One could then use a civil war spirit, WWII, or recent soldiers....Primarily use of such spirits then would be more of a general help? Would one need a restless spirit do justice to a situation, provided they were taken in life unjustly, or could one use the soldier for all purposes? Using a loved one's deceased relative would help then in serving justice as well....Would one use dirt from the feet to swiftly carry out requests? Or from the head to make the intended think? I suppose you could use dirt all sorts of ways, for instance, if you play the blues, you could use the dirt from the hands of a great blues player's grave and ask for help.....am I on the right track with these concepts...? A silver dime is the general payment but mention is made to other means, pennies, whiskey etc. By connecting with spirit then one would be able to know what payment they would require? Placing a silver dime first and if they need additional payment one would be directed? If the dead where of a certain race, say Asian, then one might want to use gifts appropriate to their customs, do you think? Placing such a bottle in a person's path is quite traditional. We sometimes prefer to place it in their yard or under their porch or house because they'll step over it more frequently, but the path is a good method too. Just call their name when you do so, setting the trap for them and them alone. Before i reply to your questions, i would like to caution you against the casual idea of "using spirits" (you wrote that you might "use a civil war spirit") -- as if these entities were mere tools or objects. I personally do not "use" spirits and i think that those who say they "use the dead" are folks to be wary of. Would they "use" me, too? Rather, i would teach you to say and to think that you "work with" or "petition" or "venerate" the dead, as the case may be. As to a soldier; they are known for bravery and for being willing to follow commands. So we call upon them for assistance in works that require a strong hand. As to relatives: they may help in any way, whether for love or protection or justice. Dirt from various places in the grave may be collected by some -- others do not make such distinctions. I have never heard of the dirt from the feet for carrying swift messages. Dirt from a musician's grave to help one master music, yes, this is common. Dirt from the area of the hands is fine, but not inherently necessary. The heart may serve as well. Coins are usually placed in threes, not one, as you suggested. Pay first in full; they will let you know if other things are wanted. Children often ask for candy, but do not offer candy first; offer the coins first. As to whether we have "had definite real experiences" in this work, well, all of the folks listed as "Certified Practitioners," plus the two "Owners" (nagasiva and me) have had personal experiences with graveyard work because it is part of the course i teach. It is explained in several lessons and the work itself is turned in by students for grading as Homework #4. The "Certified Practitioners" are all course graduates. and that's why they get the spiffy avatars. Getting a good grasp (thank you) on the principles, credits the well written information.....Thank you for setting me straight with by my wording "using a spirit". I understand how this way of describing this work would be disrespectful....Petitioning or " working with" are the proper way of approaching their help...Got it. I actually wasn't intending any selfish "use" of a spirit and I do see your point. Very Good Point. I knew that you and the Certified Practitioners would have personal experience with this work. I was hoping that some of the folks here had some personal experiences to share as well...I also was looking for a description of an actual method they followed as an example and the result....Since I had a few questions, I felt conjecture, by another novice like myself, to ponder the same questions ie "maybe try leaving an bitten apple and a dozen silver coins",etc. would not have been as helpful as some real experiences, although I would like to know what most folks here think about this. For sure. After I gain more insight, I will be asking to take your course....I intend to figure my petitioning now in some work based on the concepts set out here and along with my grasp of this work, starting with my dear relatives....I feel really excited over this...I am going first to visit, talk, and leave flowers, gifts.. then visit a few times more and continue our relationship, then I will know if it is good to ask etc.....all things in time...One thing I learned waaaaay back when I was a young and bucking filly with not enough horse sense (and learned the hard way) was the magic word "Patience".....all in good time....still tough to take sometimes but the far, far better way toward achievement! Thank you, Catherine, for the enlightenment!! As for asking folks to publicly relate their personal experiences in graveyard work, i cannot see the point of that in this forum, which is run by volunteers in order to help folks select and use Lucky Mojo spiritual supplies. Suffice it to say that spiritual work with the dead is very deep, is a significant way to empower and enhance one's magical practices, and has been life-changing for many practitioners, who generally gain a positive and affirming sense of contact with the dead thereby. As a Spiritualist, I can tell you your intuition is right about this. Firstly, thanks for the answer about the times of contact, EcleckticMama... .
Granted spiritual work with the dead is very deep. I understand this and have studied this subject from other sources.I'm a descendant from a German family of spiritualists.....and they, from what I know, got right into it. (Although they are now dead.....(can't get to their graves, some were cremated) and that might be another topic!! I, of course, am working on the concept from Hoodoo so as far as asking for the relating of experiences, I thought that one who has done such work might be using some of the herbs and plants sold here under this section of herbs and plants as well... that would be helpful in this, such as vandal root, asafoetida,and devil pod. I read in the oil section about summoning spirits and using oils/not using certain oils. Also, being LM sells the graveyard dirt as an ingredient in other spells on site. If we seem very cautious about the dead, it is with good reason. Many novice practioners have gotten some nasty surprises from visiting graveyards and that creates another set of problems. I know of many novices who collected trickster spirits who posed as dead relatives and caused havoc in people's homes. We do not want that to happen to you. cat is right about knowing what you are doing before you start working with the dead. I always suggest getting protection from your family first. because they are a great base to spring from. Working with the dead can be a wonderful experience, but you must work with the right dead, because just like the living, you must handle them with care. Thank you for your warnings....Understood.....I am going ahead to visit family graves.....I actually feel very comfortable and at peace when visiting grave sites which I have done often.I have spent entire afternoons and some nights in cemeteries.I "see" in the sense when I look at a grave with a name and its marker,I get an image of the person, a feel, so when I have more experience I hope that will work in my favor. Usually trickster spirits throw little things at me....I have copied epitaphs for local papers and offered to categorize the graves according to names. But I get the point....I plan on a cleansing bath followed by protection before I go.....then the visits.....family first ..It should be interesting and I will be ordering more of the protection items. My first kiss was in the cemetery and I was on the grass over an actual grave. I have always had turmoil in love. I think back to that day and I wonder now if something happened there....I can always do an uncrossing and unjinxing, and then at the site, or near if I can't find the actually grave being it was a long time ago, declare any curse powerless. I'll have to give it more thought as I research this subject. That is not a surprise. You disrespected a grave and proven what cat and I were saying about the dead. I have heard many stories like yours and I am sure I will hear more. If I were you, I would leave the graveyards alone and work on clean-up and protection. Well, I was a fool kid kissing in the cemetery....How little I knew back then.....We always took the short cut home from school through the cemetery for 4 years, day after day, really wonder who I disrespected back then .....What kind of clean up and protection would you recommend from this site. What would then be the best method to clean up? Would I do a special cleansing for this or general meaning using uncrossing, cleansing, then protection. What would be the best way using the products you have available at LM? I have some hyssop, eucalyptus, some other herbs with me and I can do a cleanse but are there certain products that would be good to use from the site? Cleansing oneself spiritually is fine and good (and hyssop and eucalyptus are fine ingredients in such a bath, especially combined with kosher salt and/or bluing and a recitation of the 51st and 23rd psalms), as is drinking peppermint tea to counteract the effects of excessive time spent with the dead...but might I also suggest considering the dead as you would living people: If you (inadvertantly) offended a live person that you otherwise had no quarrel with, it is unlikely that you would only cleanse yourself and consider the matter done. You might also apologize to that person, or ask if there were some way to redeem yourself in that person's eyes. Similarly with the dead, it is not unreasonable to offer a heartfelt apology to the dead that you may have offended in your youth and lack of knowledge (as you recounted above). You might also undertake some task of respect for the resting place of the dead to mitigate your previous offense. Such tasks might include picking up litter and tending to the plants in the cemetery, cleaning and decorating an individual gravesite, or offering flowers at the gravesite, possibly on an ongoing basis, given the chronic nature of your earlier disrespect. I would suggest that you pay attention to the vibe you get from the cemetary/gravesite if you do this, of course, and the usual protocols of respect, offerings to the gates of the cemetary, covering one's head, and crossing running water on your way back home still apply, regardless. I would do a 13 herb bath. Recite the 51st Psalm and do a good scrubbing with salt. After the scrub, I would get out of the bathtub between two white tempers dressed with Cast-off Evil oil. Thanks, I have ordered the 13 Herb Bath in my last order and will have that soon. I was going to use it for any crossing on me from other sources so I am on the right track....Thanks for the other methods and your concern.....I will order the Cast Off and in meantime, smoke some herbs and sage around house etc. I just moved so this would be a great time to clean house!!! A note: You all are the best! ElKnapp: Thanks for those suggestions as well.....Interesting about the peppermint tea....I have been craving tea for a few weeks of late....drinking it hot and iced....weird huh? I'll pick up litter but I am staying off away from anyone's grave except my relatives for now....I just want to show I am now respecting. Much to contemplate here and I have some other cemeteries to visit now. Petitioning your grandparents and uncle is a nice gesture, as is bringing some flowers for their graves and promising (and keeping the promise) to do regular, monthly or yearly upkeep to make sure their grave sites are clean, uncluttered and well-kept. You can also leave some flowers at the entrance to the graveyard for the spirit of the graveyard if you feel moved to do so. Another idea is to donate some money to services that many graveyards have--like for flowers or groundskeeping. Between the cleansing advice that Mary and Edward have suggested and your own determination to foster a sincere, full relationship with the dead I think you'll be in good shape! Several folks have given you advice on how to work the with spirits and graveyard dirt. If you cannot access the graveyard dirt of an animal but you will want to petition its spirit for aid then the next best thing is to get a photograph of that animal and any item you may have that you used with it, like a leash, collar, or tags, light a candle anointed with psychic vision oil and ask the animal's spirit in a sincere and heartfelt way to assist you. Depending on what tradition you come out of you may feel moved to make an offering in return for aid (like I will donate x amount of extra time working in rescue this week). you all have fantastic ideas. i also have walked to the cemetery gates in a pair of old shoes, stepped out of them and left without looking back. kind of a foot track idea. i do have a question..
what if the deceased was cremated then buried? does this affect the graveyard dirt negatively? would it neutralize its power, or would it be more powerful as "ashes to ashes" and the added element of fire? i am working on the assumption right now that it would be no different from a regular burial but would like to humbly ask for clarification. Actually, that is becoming quite common these days. Yeah, I would also like to know how to get a reckless spirit to do that work! -- but that's all i am willing to share in public. As Mary Rose, one of our Certified Practitioners and Forum Moderators, said in answer to another, similar question, you should get some study and practice under your belt before you go off to a graveyard looking for spirits -- especially reckless spirits of the type i was mentioning. To strengthen your intent and linkage, keep the bottle around and shake it up regularly, while cursing, to add what energy you can. Stash it behind the toilet on the ground (low, down, and dirty) while having it in your home. Do this for at least one cycle of the moon before burying it at a graveyard, and when you do so, call upon (and pay) a reckless spirit to carry it to them, since you are unable to do so yourself. I was told to toss the break up bottle spell into a graveyard... while facing your back to the graveyard and tossing it over your left shoulder. Is this sufficient? Or do i need to burry it? What if I toss it, and someone finds it and opens it or messes with it? spacemonkey wrote: I was told to toss the break up bottle spell into a graveyard... while facing your back to the graveyard and tossing it over your left shoulder. Is this sufficient? Or do i need to burry it? What if I toss it, and someone finds it and opens it or messes with it? Throwing a bottle into the graveyard will not result in your finding and working with a reckless spirit, as previously described. This thread is drifting all over, and is not serving anyone well. To recap: Burial of a prepared jinxing or Break-Up bottle in the grave of a reckless-hearted dead person who agrees to work with you in spirit for a monetary payment that you tender to him is NOT the same as tossing the bottle into a graveyard and waking away. The intent, result -- and most importantly the spirt contact or lack thereof -- set these two types of spells apart from one another and show them to be not equivalent to one another. Additionally, when someone comes here and asks me or my colleagues to comment on what another practitioner, book, or web site had "advised" or told them, we are placed in the extremely awkward position of having to agree or disagree with a half-recounted tale for which we do not understand the basis in thought, history, or practice. Please do not ask us to confirm or oppose the works you are performing under the instructions of another teacher. We cannot and should not speak to those issues. I will say, though, that burial is what is called for here -- and NOT burial in a graveyard! As stated at the outset, Break-Up bottles are deployed traditionally and authentically by a different method, one of contact through the feet. The parties must walk over the buried bottle spell. Deploying the Break-Up bottle in the grave of a reckless spirit is only a weak second choice, in my opinion, as no contact is made with the target(s). Aimlessly throwing the Break-Up bottle into a graveyard like you were told is simply disposal to me -- it is not deployment. Finally, as i have already said, graveyard work is deep. That's why i set aside six out of the 52 course lessons to desribe and teach it. Asking for a complete overview here is not going to get you much. 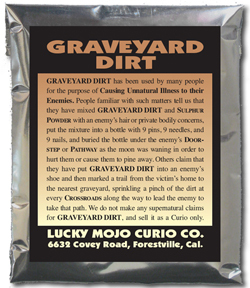 We do sell Graveyard Dirt at Lucky Mojo, and i advise those new to graveyard work to buy and try some of that, and see how you feel about it. After that you can undertake to work in a gaveyard of your own. But be advised, it is not a simple matter. There as many types of spirits as there are people... and in the graveyard you will be meeting many strangers. Some may befriend you and work with you for the rest of your life. Others may shun you, or trick you, or prove too weak to aid your cause. Try to understand that working in a graveyard is not so difficult that only experts can do it -- but it not so simple that a few words on the internet can convey it to you, either. see where else it would fit in. you buy the dirt or borrow it. I have not heard of borrowing graveyard dirt. It sounds strange to me since part of what we buy when we buy dirt is the spirit of the deceased's agreement to aid us in our endeavors. Also there is a difference between buying dirt and leaving an offering--they are two different things, the money that you leave on the grave for the dirt is one thing, bringing flowers, a drink, a favorite food, etc is leaving an offering and most folks who get graveyard dirt will do both. I have never heard of "borrowing" graveyard dirt. in Hoodoo, but I guess its custom is just for that system. I'll agree with Bri and Mary and add that I can't think of any standard use for graveyard dirt where you would get it back in order to return it. It's either deployed or disposed of with the rest of the spell. Maybe use in negative work where something is buried in the graveyard, you could add it to the work and then bury whatever it is in the same place you got the dirt from; that might be considered "borrowing" by some. Then again, I wouldn't try to leave the graveyard with dirt I hadn't left something for to begin with.